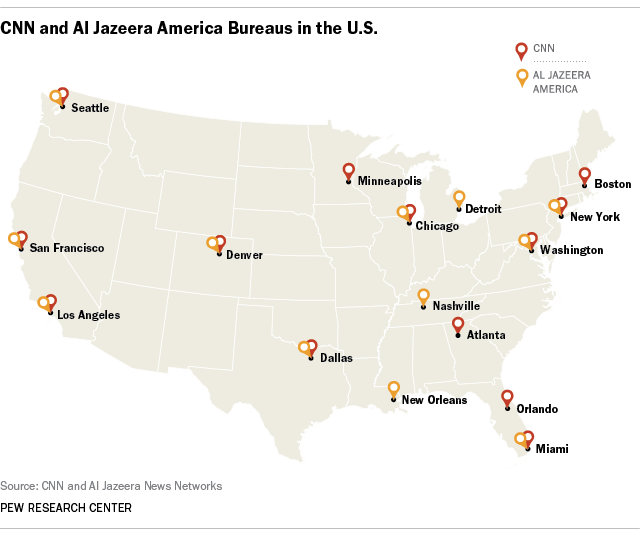 It’s not on the air yet but, already, Al Jazeera America is creating a buzz in the world of journalism. Unlike so many news outlets that have been shedding staff the past few years, it’s hiring (and hiring big), bringing on about 800 employees as it prepares to launch an ambitious cable news channel later this year. Now, Al Jazeera’s owner, the emir of Qatar, is taking a new route into the American market. Earlier this year, the emir, Sheikh Hamad bin Khalifa al Thani, paid an estimated $500 million for Current TV, the cable channel founded by former Vice President Al Gore. The move will give Al Jazeera America, currently scheduled to launch in late summer, access to nearly 50 million households in the United States—roughly half the number of American homes that receive CNN, Fox and MSNBC. Whatever its owner’s motives, Al Jazeera is making major changes in its approach to potential U.S. viewers. Its existing English-language channel, Al Jazeera English (soon to be renamed Al Jazeera International), is based in Doha and concentrates on global news. By contrast, Al Jazeera America will be headquartered in New York City and will focus on U.S. domestic issues, according to spokesman Tony Fox. Upon launching, it plans to have 12 bureaus scattered around the country, the same number as CNN. It also will have five foreign bureaus and use news reports from Al Jazeera’s 65 existing bureaus around the world. By way of comparison, the BBC has 41 international bureaus, CNN has 33, MSNBC has 14 and Fox has six. Meanwhile, Al Jazeera America says it is hiring 800 journalists and other employees, almost all of them in the U.S., to staff the new operation. The investigative unit alone will employ 16 journalists, and the Washington bureau will include one White House and one congressional correspondent, among others. Al Jazeera America reportedly will be broadcasting from a studio most recently used by ABC’s “This Week” in the Newseum in Washington, D.C.
A typical day on Al Jazeera America will include 11 hours of traditional news, starting with a three-hour weekday morning show, with anchors in the studio and reporters in the field; a one-hour news magazine; talk shows, and programs devoted to sports and entertainment, its spokesman said. The channel also will air a one-hour news magazine and has plans to produce and acquire documentaries. The new channel has hired some respected names in journalism. Already on board are Ali Velshi, former chief business correspondent for CNN, who will create a primetime business program; Ed Pound, an investigative reporter formerly with The New York Times and The Wall Street Journal who will head the investigative unit; John Meehan, formerly the global executive producer for Thomson Reuters, who will be a senior executive producer; Andrea Stone, formerly a reporter for The Huffington Post and USA Today, and Tony Karon, a former senior editor for Time magazine’s website, who will be senior online executive producers for the digital team. But even as it plans to build a robust news organization, the fledgling channel faces an obvious hurdle. News in early January that Al Jazeera had purchased Current TV elicited questions about possible bias in its reporting, particularly on the Middle East. Jodi Enda is a Senior Writer at the Pew Research Center's Journalism Project. Emily Guskin is a Research Analyst at the Pew Research Center's Journalism Project.